Posted on Thu, Mar 15, 2012 : 5:59 a.m.
Michigan went 11-2 in Brady Hoke's first season as head coach, ending a seven-year losing streak to Ohio State and winning a BCS game since 2000 in the process. He remains guarded, however, sharing examples with his staff of how quickly a program can crumble with one misstep. When Sports Illustrated released a story last month that detailed rampant drug use and insubordination in the UCLA basketball program, it was met by some with a shrug of the shoulders. College kids party, and it happens everywhere, some criticized. Brady Hoke was not one of those people. The Michigan football coach is looking good these days. His skin is bronzed after a four-day vacation to Florida during spring break. He appears more rested, now that he's three months removed from the grind of a regular season and bowl run. Putting the bow on a top-10 recruiting class for 2012, and getting off to one of the best starts in school history for 2013, probably helps put his mind at ease, as well. But that relaxed exterior can be misleading. Hoke remains guarded. He knows just how fleeting success can be. And that's why when SI released its story on the Bruins, Hoke forwarded it -- with a personalized note -- to each member of his staff. "I ran a copy off for everybody in this building, from coaches to strength staff, because that's" -- he snapped his fingers, pausing for effect -- "how quickly all this can go, if you don’t dot your I’s and cross your T’s," Hoke said, looking around his lavish office and gesturing toward a view of Schembechler Hall's indoor practice field. "You have to pay attention to the details, and remember the accountability and respect and trust and how we’re going to do things. Or it won't last." Such is the tenor around Schembechler Hall these days, as Michigan prepares to open its 14-practice spring camp Saturday. The Wolverines went 11-2 in Hoke's first season, ending a seven-year losing streak to Ohio State and winning the school's first BCS game since 2000 in the process. Spring camp will have a much different feel than it did last year, when Hoke and his staff were installing scheme changes on both sides of the ball. They went back to basics, teaching terminology, drills and fundamentals. Now, that foundation has been established, and 15 starters return with a year's experience in the system. That allows the staff to focus more on points of weakness and the development of younger players, which should pay dividends in the fall. "You have a base of how we want to play and how we want to teach, and I think they understand those expectations, and how we want to practice, and how we want to compete in winter conditioning, and how we want to compete in the weight room," Hoke said. "At the same time, every team’s different, and we lose some significant players from both fronts, and that’s where the game is played." That will be a focus of camp, as former guard Ricky Barnum learns the nuances of center, Michael Schofield becomes a full-time tackle for the first time and the team breaks in a new left guard. On the defensive line, the Wolverines' only returning starter, Craig Roh, is switching to strong-side end. But elsewhere, Michigan will have nearly everyone back. Hoke said his team is healthy, too, with only defensive lineman Nathan Brink sidelined. That should make for a spirited camp. So, too, will the fact the Wolverines didn't win a Big Ten championship. In the end, they exceeded any realistic expecations set for them last year, but still fell short of Hoke's ultimate goal. "That still bugs me," Hoke said. "We moved the program a little bit, hopefully, in the right direction. We gave a lot of people a lot to cheer about, and that’s fun, because of the passion people have for Michigan football. But our goal is to win the Big Ten championship. "We didn’t do it. We played two games on the road (against Michigan State and Iowa), and give credit to your opponents, but we didn’t play like Michigan. That sticks with ya." That hunger will help Hoke as he embarks on protecting something he built -- the first time in his career he's done that as a head coach. He left Ball State after taking it from 4-8 to 12-1. He inherited a 2-10 San Diego State program, then left for his dream job at Michigan after going 9-4 in 2010. Building a program and sustaining a program are two different endeavors. He's entering uncharted territory. But he's on guard, knowing how fragile any success can be. Hoke said he doesn't read press clippings about his team. The only media he regularly follows is USA Today, and even then, it's mostly the Life and Business sections, save for the occasional article about his beloved Cincinnati Reds. But when he saw NCAA sanctions being handed out to the North Carolina football team this week, he took notice. He followed the story closely, using it as a warning of how quickly a program can crumble after a misstep. The UCLA story really bothered him -- so much so, he's talked about it at staff meetings. And he brought it up to a reporter without being asked. "I think it just shows you how fast, and how fleeting, success can be," Hoke said. "We won 11 games, we won a BCS bowl game, but we want to be back. We want to win a Big Ten championship. "I think everyone got the message." Thu, Mar 15, 2012 : 10:10 p.m. Right on. One Ed Martin, drug dealing tattoo parlor owner or child molester and the whole things comes crashing down. Know what's right and then don't cover up for anyone, anything, any time. It's really not complicated. Guys like Tressel, Paterno and Richard Nixon show us the cover up is worse than the crime or the worst crime. Go blue zero tolerance We are Michigan! Fri, Mar 16, 2012 : 5:22 a.m.
Well said Scott. Truth is, you can't control every player or every staff member. But you damn sure better not sweep any known wrongdoings under the rug. Without ever having met the man, I'm confident that Brady Hoke would never do any sweeping or blind eyeing in his program. Fri, Mar 16, 2012 : 5:20 a.m.
Thu, Mar 15, 2012 : 6:39 p.m. I think it is clear why Dave Brandon hired Brady Hoke. Beyond the love and passion for Michigan, he is a man of high standards with himself and everyone around him, in all aspects of life! I remember a couple of years ago people continuing to ask what a &quot;Michigan Man&quot; is and hearing that &quot;it really is not that important&quot;. Well my friends, Brady Hoke is who we invision as a Michigan Man, it is why he is successful on the football field, in homes across the nation with parents, and off the football field as a good person! He has moral convictions that he does not waiver on! If anyone ever has the chance to listen to Hoke do a presentation on DLine or Oline play you will also understand why he is so good at teaching kids how to play the right way! Go Blue!!! Thu, Mar 15, 2012 : 4:55 p.m.
And that be the success - Coach Hoke does all the little things as well, things that can make the biggest difference. The term 'Michigan Man' is hated my many, but the truth is the term means completes integrity of all those little things that represent the university and 133 years of the best football in America. Coach Hoke knows this, and as well as educating and training his charges - the 'Michigan' difference stands above the rest and reminds him daily of that importance. MgoBlueForTiM.......making the Hoke difference every single day. Thu, Mar 15, 2012 : 4:51 p.m.
Thu, Mar 15, 2012 : 6:20 p.m.
All those CAPITAL LETTERS should do the trick. Go blue! Thu, Mar 15, 2012 : 5 p.m.
You know DB, I hate to say it but you have great knowledge of the majority of our fan base. You, I, our faithful on this site, the coaches and players expect to win every game - but we need more help. Your comment 'hope and wish' from many fans, is exactly why some label us a 'country club school' ! Thu, Mar 15, 2012 : 3:49 p.m.
Tough schedule, losses at center and the D line not easy to overcome. 10 wins would be a very good season. Thu, Mar 15, 2012 : 1:25 p.m. This coach has it together. his mind is in the right place. The 2012 schedule will be tougher than 2011 but I won't surprise me if this team wins more games than expected by the broad fan base. 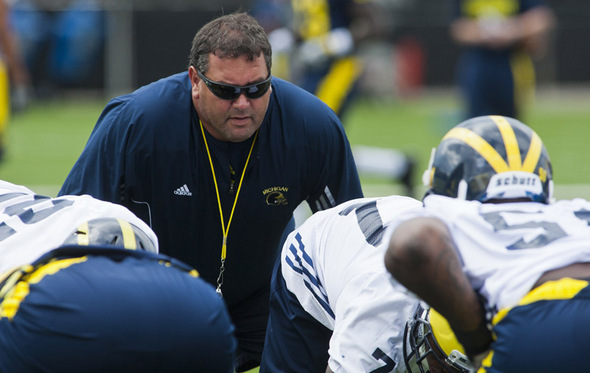 Brady Hoke is on the right track and more success will come. Thu, Mar 15, 2012 : 11:14 a.m.
My opinion is that coach Hoke has solid integrity and coach knows how to win (the formula). It is my opinion that coach Hoke has a good supporting staff and maybe just as important I believe coach is flexible on game days which I think is a good thing especially when your original game plan is not working like the Virginia Tech game. Most coaches would have lost that game but it is my opinion that of all games we played that particular game was a coaching masterpiece for coach Hoke with ohio a close second depending on your point of view. Even if year two is a bit of a let down doesn't matter because I believe coach Hoke is the real deal. Thu, Mar 15, 2012 : 10:57 a.m.
Thankful Coach Hoke is on top of it.